SO, I can’t just NOT post anything, right? Okay, maybe… with a return to the rigors of academia I’m effectively getting the creative life squeezed out of me, but, occasionally I suppose inspiration will strike. For now, I’m filling in some big, big gaps - all of which has to be reduced to bullet points. Yeah, these aren’t “bullet points” in the traditional business sense... it’s me. Puh-lease. There were a few bright spots, however - there are ride reports posted from May, where I tackled my first distance runs at gravel, and for June for the Mighty Peculiar and Old KC Road rides; the growing theme, however, had been the heat. 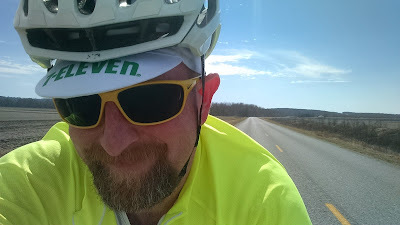 While May wasn’t bad, June’s rando rides were met with humidity and high temperatures which would begin to do wholesale damage to my performance and recovery. Still knocked backwards by the late-July gravel 200k, Gravel Worlds was far too easy to skip. Didn’t go, didn’t happen - and I’m using it as motivation to continue to train and practice until I get “there” - wherever “there” may be. The level of fitness apparent in my peers is impressive - and until I can knock off a gravel 200k with the same relative ease as done on pavement, I have no business signing up for ANY event. Not going to make it a big deal, or a “must-do” - but, at this age in my life if I’m going to get serious I need to just do it. The time for carrying around extra body weight and doing these rides, but then complaining about ‘being slow’ are in the past. I don’t want to squeeze the fun out of what I’m doing - because I still have a great deal of genuine fun on long rides - but, I can’t be complacent anymore, either. The “solution” I’m seeking has almost nothing to do with how long I’m at at a control or not, nor how much my bike weighs, or what sort of tire I’m running. It has everything to do with my body, how much I should weigh for my height, and how I treat myself. While I did log an August 100km ride, there was no August 200k and no September 200k, and no October 200k... and barely any commutes to speak of during the period. July punched me out, but hard. Only a week later, the New Year’s Day 200km ride was upon us - and while I hemmed and hawed about it in the comfort of my car’s heat at the cold start line, I ultimately made the correct choice for 200km to keep the streak going (as opposed to the also-offered 100km option that day). In strong company with John M. and Spencer K., and thankfully with John nursing an injury (lest we never see his wheel again after mile 15), we enjoyed a nice day out on the Princeton Roundabout route under brilliant skies and passing clouds, capping off the day back at Barley’s with Spencer for another great post-ride brew... I could get used to this. Rewards are good! That whole moderation thing still in-check... waking up the next day, legs feeling fresh like I hadn’t even performed anything beyond the strain of walking the dog. Nice! March has brought a bit more enthusiasm and opportunity; but, still I found myself kicking the March date downstream a couple times. Anxious to knock it out on the 6th, plans changed. The 20th came, but, I had fallen ill. The 27th... icky weather... but, no more month left and no more opportunities! If I’m going to do it, it has to be NOW. That was yesterday. Amid a mishmash of self-talk I ambled out of the garage and started at a “traffic-friendly” (and yet, sleep-friendly) 8:30AM to grab the March requirement, amid what I will call “aggressive drizzle” and a nice northerly tailwind (which I’d come to curse later, for obvious reasons). Back on the Border Patrol route - not what I’d wanted, since variety is a good thing - but, necessary under the circumstances. Still, could be worse...like, could be starting all over now! After reading a great article on the trials of achieving the Ultra R-12 award (see RUSA’s webpage), and the whole concept of R-120 (! ), I’m inspired to keep the streak going. Granted, talk to me in 12 months and see how life has allowed this - but, really, it IS possible. Sometimes “possible” is all I need. This latest run at the Border Patrol had me trying some new things learned over the last couple of brevets with other riders present. Discussions about fighting fatigue and dilution-based dehydration (almost hyponatremia, but not quite - just low on electrolytes due to too-dilute of a solution), and “smarter calories”. Things like Snickers bars. I mean, they’re EVERYWHERE - at least in the realm of c-stores, and yet, I’ve never had one during a ride. I know what they ARE, mind you - but, in the context of seeing if they’d work for me on a ride? Heck no, that’s “candy”... right? Well, I tried one, and BANG... that’s good cycling food, dude. At least on that day, at least at that milepost. Knowing that I have WAY more options at the stops solves a few problems: less hauling around powdered nutrition that may not be doing me any real good, and less c-store aisle paralysis. The bigger my list of “food that works”, the faster I can get out of a control knowing that I’ve got good energy on-board to make it to the next one, and so-on. Same with hydrating... I’ve noticed a lot of “camel-like” people just sipping water on hot rides, never complaining about cramps or fatigue, where -- by comparison, and especially when looking back at July ‘16, I’m guzzling water and trying to stay ahead of a hydration curve that I can’t really beat. Now, it’s not HOT yet... so I have to continue to practice this carefully... but, this notion of maintaining an isotonic environment. I’m glossing over the science here, because you can read a lot about it elsewhere... but, my theory involves not really hydrating correctly when I should be, not recognizing the warning signs, and not acting accordingly. It’s tough to do in practice, when it’s hot and one isn’t feeling well, which is why so many people get themselves into trouble when the temperature skyrockets. I’ll be approaching hot weather rides with a bit more intelligence this year, to see if I can remedy some of the issue that derailed my efforts last year. So, there you have it... you’re up to speed, and so am I. Back into a steady streak, enjoying commutes when I can, and revelling in the nice springtime weather. Stay tuned... while the post frequency is likely to remain low for at least the next couple of years while I remain involved in worthy pursuits, I’ll at least try to keep up the occasional post and ride report. Enjoy spring! Riding weather is here!